This individual Report Back To The Future With Alternative and Promotional Credit is available for purchase. This Report is available to members of Mercator Advisory Group’s Credit Advisory Service. Please be advised that this Report is normally part of a research and advisory service that provides ongoing support throughout the year. As such, this Report contains significant depth of content that is selected for its strategic importance to our members. (For a description of these services, see our Advisory Services section). * A new generation of promotional credit offerings through alternative lenders are providing new competition to general purpose credit cards. * Alternative lenders, focusing on online delivery and niche market opportunities, are incenting consumers through promotional credit terms, and often avoiding the added costs of reward programs. * Working within their market niches, alternative lenders offer an array or promotional credit terms which can be customized to the needs of merchants/seller. * Services like PayPal Buyer Credit and Bill Me Later are creating ubiquitous new web-based credit sources. * New private label "cards" are providing promotional finance capabilities to the airline industry, separate from their more costly co-branded rewards cards. For purposes of illustration, the report examines the five varieties of alternative financing, each with its unique promotional and transactional qualities that make it competitive with general purpose credit card transactions. All five varieties represent types that could be put on a credit card, and where most merchants do accept cards. But each represents an opportunity for the merchant to institute a promotional opportunity to assist in the sale, and perhaps lower the cost of a transaction as well. 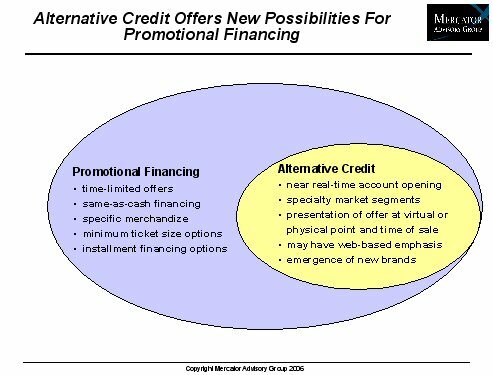 Promotional financing is undergoing a revival through alternative lending sources. Ken Paterson, Director of the Credit Advisory Service at Mercator Advisory Group and the author of this report comments that; "'Alternative Credit' does offer some innovations for promotional financing. It provides near-real-time financial incentives in the form of promotional credit terms to consumers. Many promotional financing incentives are old favorites like '90 days same as cash', but the application and approval are nearly instantaneous, and the offers can be highly customized to the specific merchandize or merchant. The merchant/seller may actually participate both in setting credit terms and funding them. There may be nothing new with promotional financing by way of the credit terms themselves - it is just delivered faster, with less hassle, and in a more personalized manner."